I never could get the scenery to work, but what are you doing with it Jason? So if you are using my version, it was designed for FSX so that's probably why. You're probably gonna need to use the converter above. 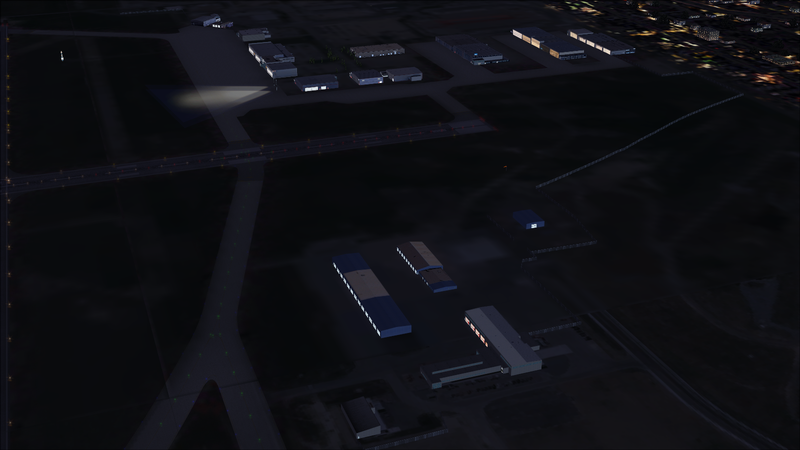 Anyways, I am adding custom ground polys to the airport, mostly through ADE. I might add darkening patches/night lighting through gmax but most of these things will be slow since I'm pretty busy this year due to school. I'm glad you're interested in this project! Maybe during the summer I might redo the terminal so that it is more accurate and maybe even design an interior. @Emmanuel Mwandosya, Great work on the scenery. 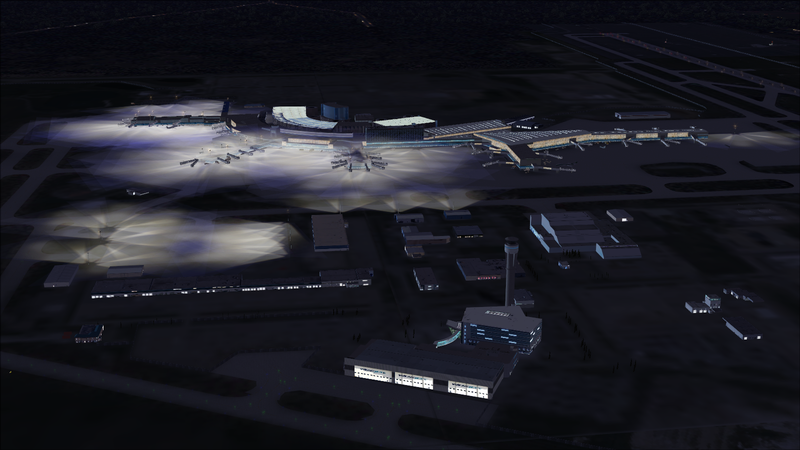 Thanks for making this Airport for FS9! Just a few comments which I hope you can probably add to it as an update. 1- Would it be possible to add some ground markings? Such as Gate numbers and taxiways, stop marks etc or any markings that are on the ground to give it a realistic feel? 2- Can you replicate the realistic jetways of the airports to give it a more realistic feel instead of using the default Jetway objects? it would be nice to seem them included! Its beautifully modeled and I am sure these two things will make a huge difference in the scenery. I hope you can make this change in an update soon! Sounds nice! @Jason z, Would it be sort of a plug and play thing? software wise? I tried to use the jetways Emmanuel suggested however it doesn't seem to fit nicely with the scenery he made. 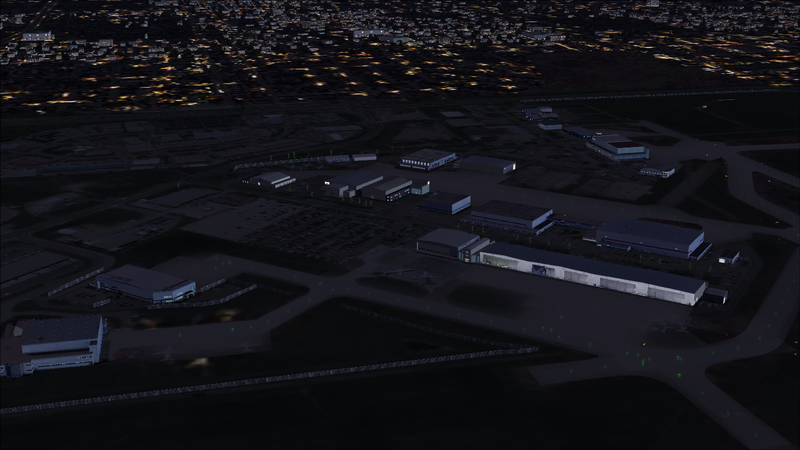 Looks allready nice... you may rework the photoreal ground Polies as well... when the apron and the taxiways are done. You might contact the Guys from Flytampa or Mr. Drzewiecki from Drzewiecki Design Sceneries, to help you on this or even to povide you some textures to use on this Scenery. In order to end up with the highest possible Quality on Airport / Scenerydesign. I'll see what I can do (right now I'm quite busy with school work so I don't think I'll be getting much done around this time of year) but that sounds like a great idea! Emmanuel will have the final say on whether or not that's ok with him since this is his scenery. I'm just helping out a little. Are there any news about the progress of Calgary? 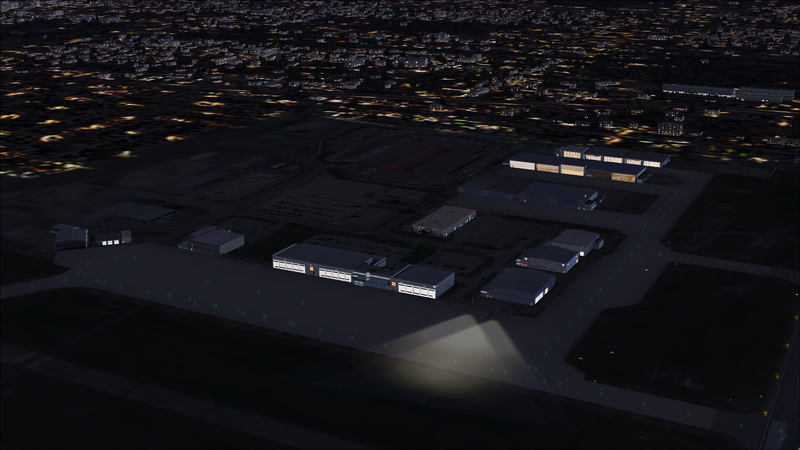 And if possible, I would love to have better night illumination of Taxiway lights and ground, apron and taxiway signing, which is missing a little bit too... Taxiways, runways and aprons are a little too dark IMHO. Yup, I was hoping that the new ground polys would replace lighting like that. 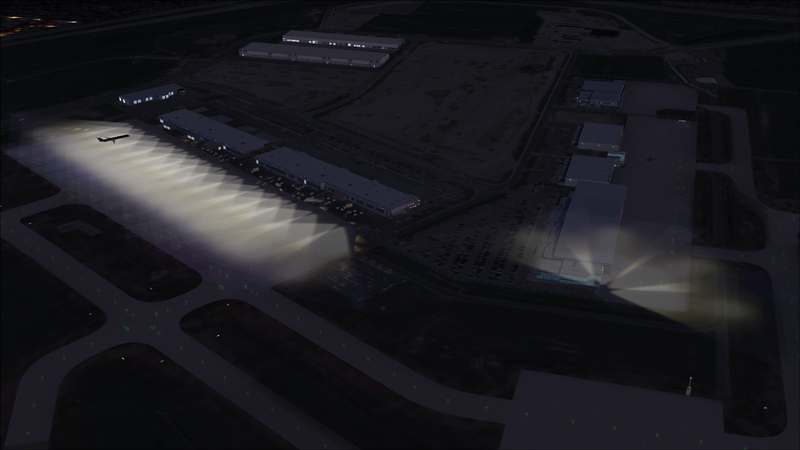 Since they are ground polys, they don't require light poles to go with them so I can add it to the international terminal where the light poles are part of the terminal rather than separate objects. The current lights look like the Jim Dhaenens library stuff (I might add his animated radar though). Not only do they overlap but they also severely impact frame rates. I haven't been able to get much done on CYYC however because I'm right now involved in CVG which is a bit more manageable. Unfortunately this is one of my bad habits, I have to cycle between YYC, CVG, and CLE whenever I lose motivation to do a certain one if I feel a bit overwhelmed (finals are also this week). Kept my word so I've been working on the main terminal at YYC since I think it needs an overhaul (with all due respect to Emmanuel). 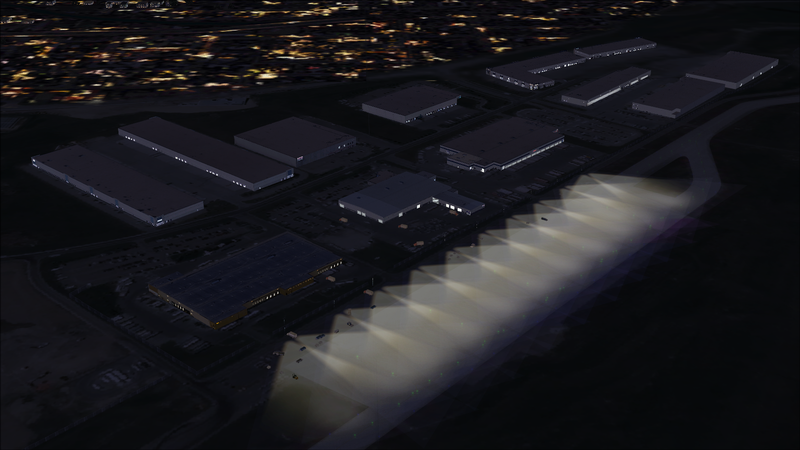 Edit: will you add some custom Passanger Bridges to the terminals or will it remain with the once from Runway 12 Library? Yup, I will add static custom jetways which will be unique to each gate (usually unique in positioning but occasionally textures as well depending on what they look like in real life). 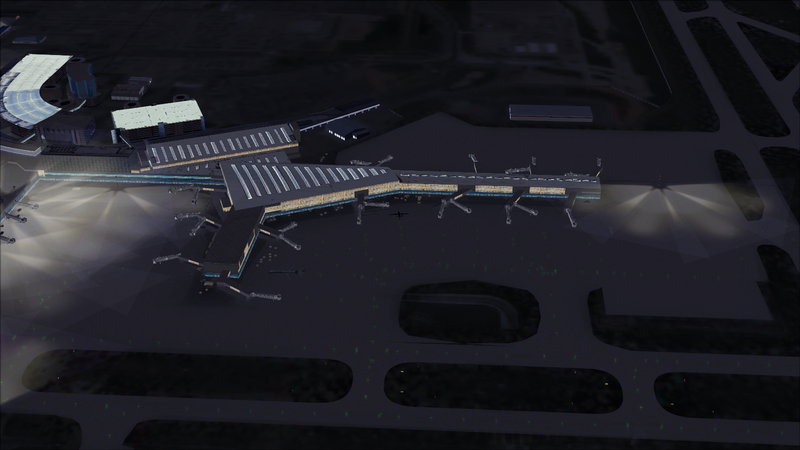 However I don't think I will model the interior to the terminal as that will take way too much time.